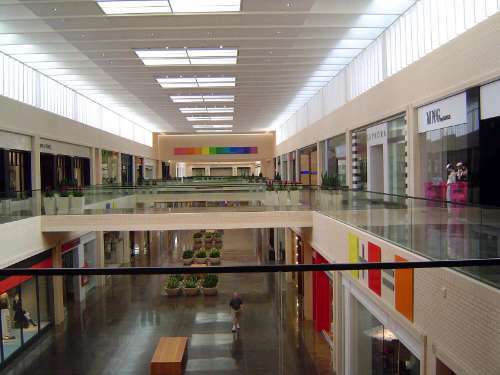 The Dallas/Ft Worth metroplex has 28 square feet of shopping space for every resident; that's more even than California. We'll look here at the evolution of that space. Dallas had hundreds of mostly independent grocery stores until about World War I, when chains began forming. 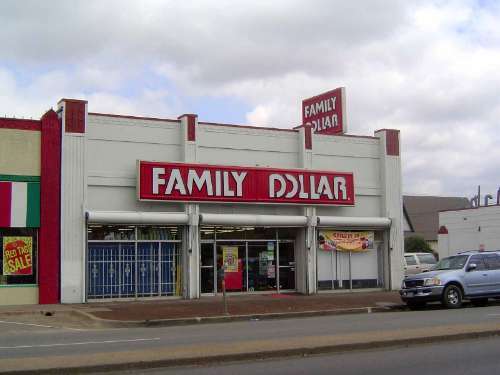 The biggest were Star Cash, United Grocery, and Piggly Wiggly. By 1934, however, the dominant company was Safeway, which had 17 stores with its own name, plus control of Piggly Wiggly. Here, on Jefferson Boulevard in Oak Cliff, is one of those early Safeways. 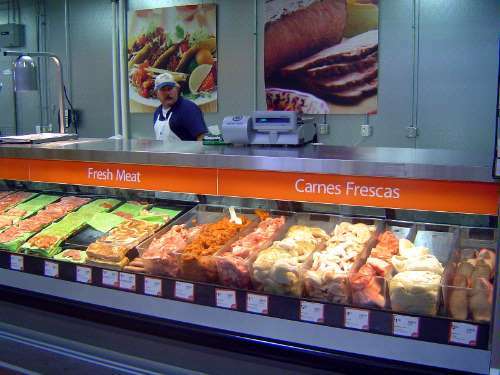 Here's another, operating under the name Tom Thumb, which Safeway acquired in 1999. Paradoxically, the store before then was called Safeway. This photo was taken shortly after the conversion. 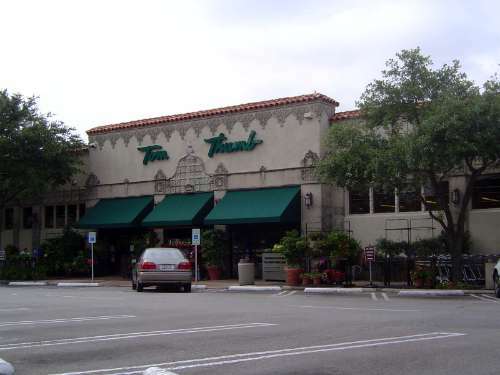 Fast forward 20 years, and Tom Thumb had moved out, leaving the space to be chopped up into several small stores. 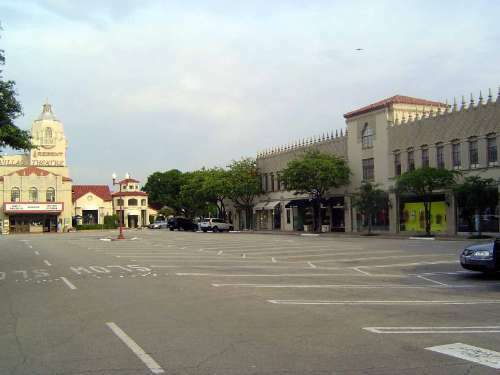 The architecture is unusual for a supermarket, but this is Highland Park Village, a remarkable development in its own right--the first shopping center in the country to be designed as a set of stores with a unified architectural style and surrounding its own parking lot. 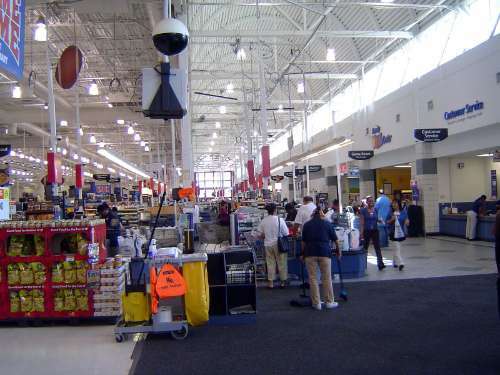 The Cullum family that built Tom Thumb partnered in the 1980s with Wal-Mart to create a set of hypermarts. 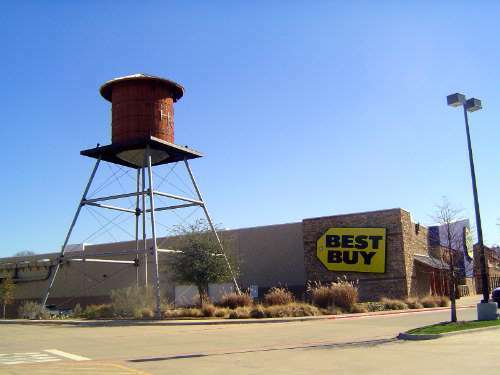 There were two near Dallas, one on the west side in Arlington and one--this one--on the east side, in Garland. 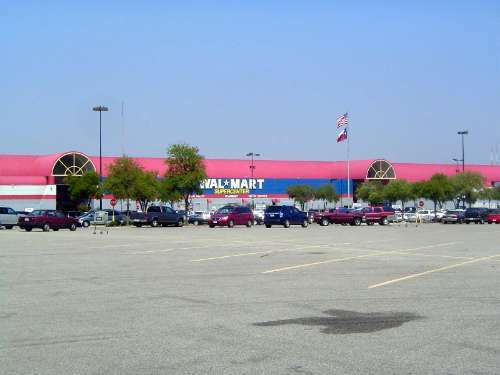 The partnership didn't last--Cullum couldn't keep up with Wal-Mart's expansion plans--and neither did the barrel vault. It was a flourish that cost money that Wal-Mart apparently didn't want to spend. Presto! 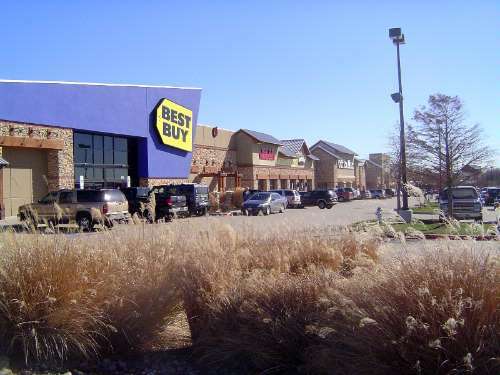 The store closed late in 2008. 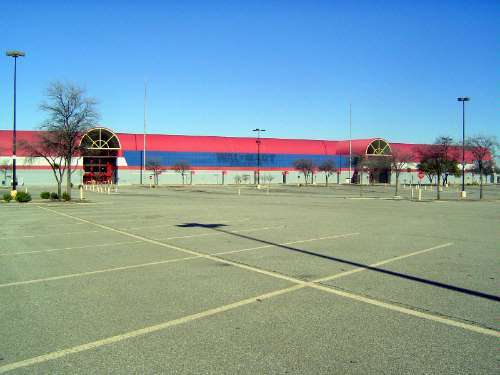 It was still sitting empty at the end of 2015, when the Garland city council turned down a proposal to convert the building into some combination of indoor-sports center and self-storage units. Unhappy with the rejection, the mayor fretted that Garland could be stuck with a "white elephant" for years to come. 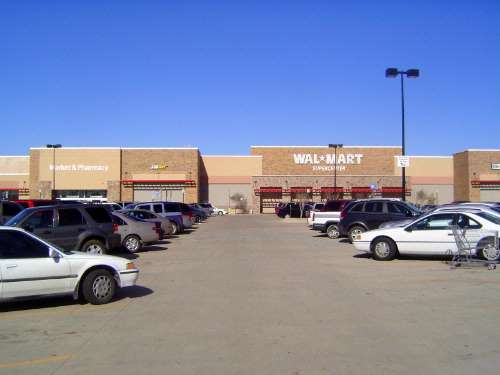 The replacement store, a mile to the south, demonstrated Wal-Mart's determination to tailor stores to particular markets. 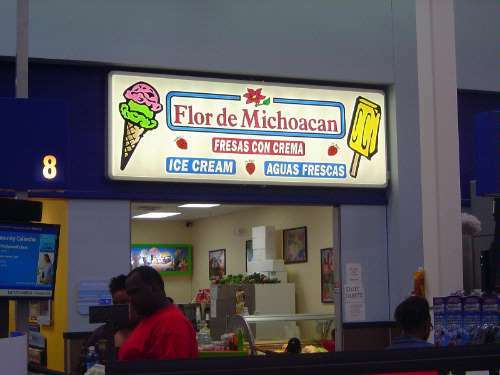 This one was the company's first Hispanic community store. You're skeptical? Step inside. 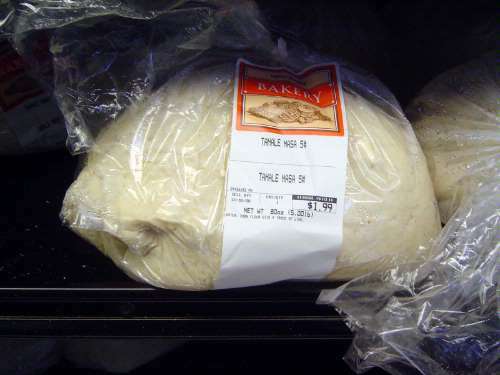 Tortillas are made from scratch. Signs are bilingual, with the two languages treated as equals. 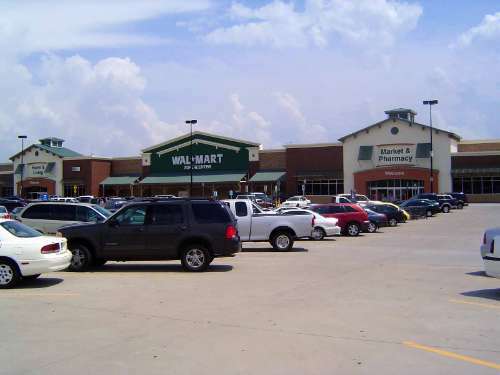 Here's another example of a tailored Wal-Mart, this time for the Plano market. Note to self: never underestimate the power of nostalgia. Inside that store, the first department is a big wine shop. 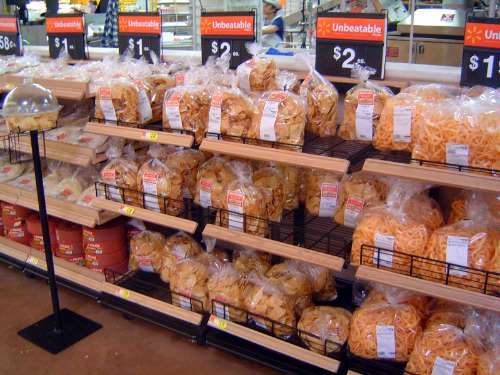 Cheese is next door. 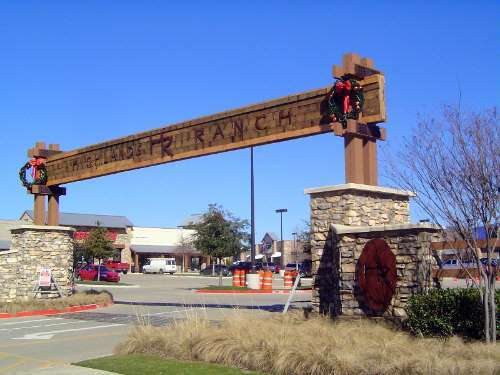 Here in Flower Mound, the Highland Ranch strikes an Imperial Texas motif. The strips of metal on the ground are a mock cattle guard and make a very satisfying clatter, even if you're one of the three people who drive in daily with a car instead of a truck or SUV. Another manly object, although they still have to work on the proportions. 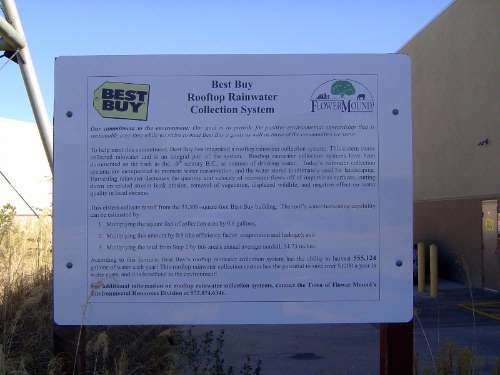 Yes, eco-consciousness exists even in Texas. But we've gotten ahead of ourselves and have to back up to Highland Park Shopping Village. Don't be misled by the empty parking lot; we're just early in the day. The neighborhood demographics are so strong that the shops include Anthropologie, Bang & Olufsen, Harry Winston, and Jimmy Choo. The Village was acquired for $170 million in 2009 by a partnership including some of the descendants of H.L. Hunt. The seller had paid $5 million in 1976. Think the Village Theater plays foreign films? Good guess but no bananas: in 2017 the space was sliced horizontally to make way for an Italian restaurant upstairs and a pizza place down. Chalk up another victory for Amazon/Netflix/Hulu. Preston Center, two miles to the north, opened in 1951 and copied the Village. The average household income within a one-mile radius exceeded $260,000 in 2007. 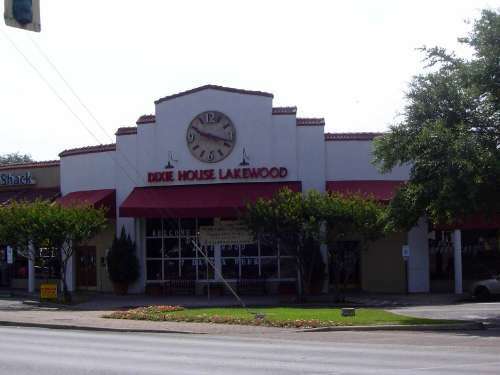 Down a notch or two, the Lakewood shopping center is from the same era. It's on the west side of White Rock Lake, an area that was surrounded by housing by the end of the '50s. 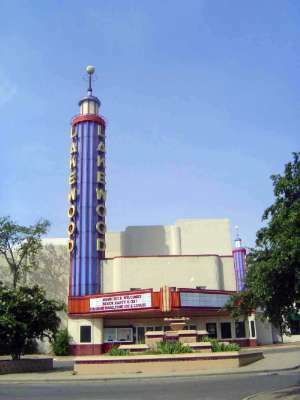 Part of that Lakewood Center, this theater was commissioned in 1938 by the owner of downtown's Majestic Theater. Somebody could make a map of movie marquees like these. 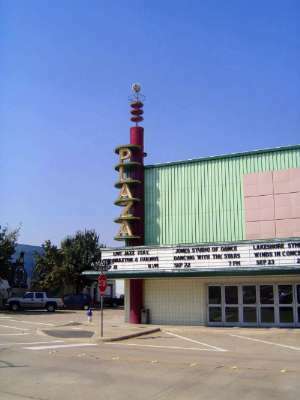 This one was added in 1950 to a theater from 1941. 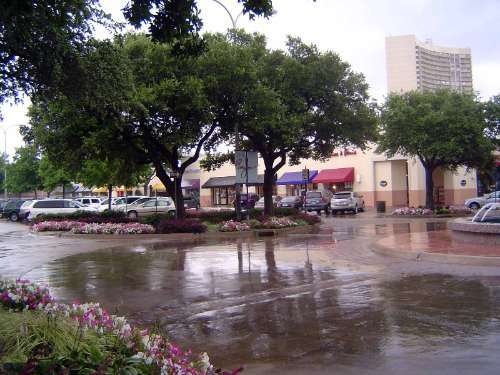 It's in Garland, once a freestanding town but now part of metro Dallas. Fast forward to 1959, when Dallas got its first enclosed mall. 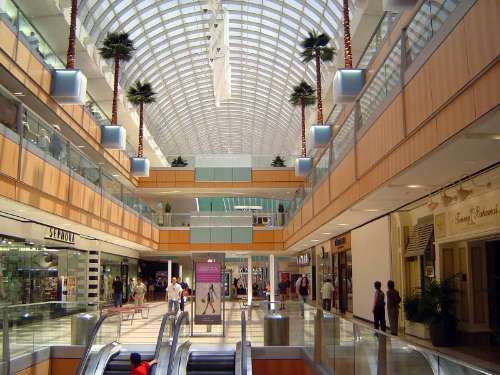 Big Town's developer had just opened Denver's Lakeside Mall. In the distance you can see the pole sign in the last picture. 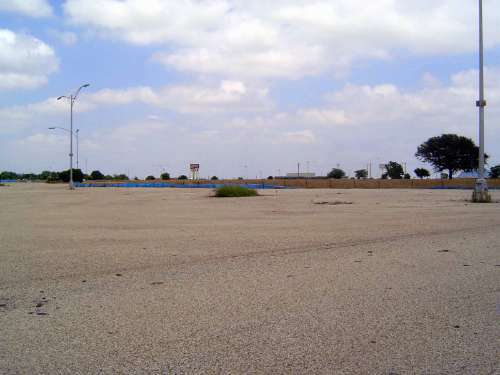 The parking lots are intact, but weeds cover what was once Montgomery Ward, Woolworth's, Kinney's Shoes, and lots more. 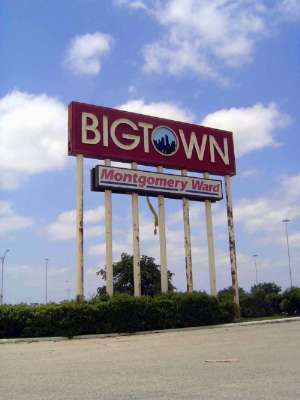 Those names, of course, are all as dead Big Town itself. 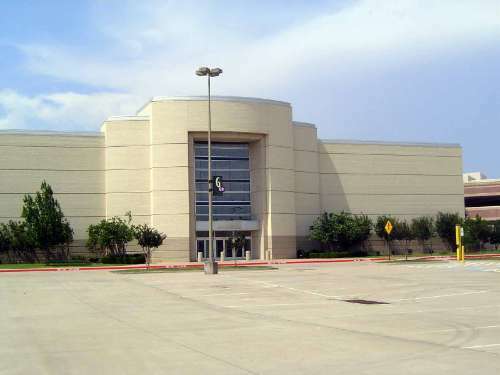 Newer malls, especially one called Town East, killed it, and the mall was demolished in 2006. It sat for 10 years until 2016, when a company called 42 Real Estate announced that it would build a regional distribution center on the site and lease it to FedEx. 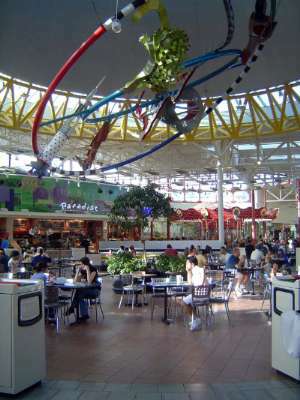 The north side of the metro has plenty of malls; the south side has almost none. 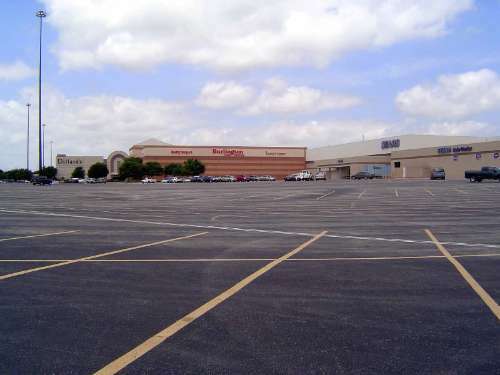 Here's the exception, Southwest Center, which opened in 1975 as Red Bird Mall. Eddie de Bartolo, a nationally prominent developer, built it, but it's been in trouble for years, and the opening in 2008 of Uptown Village at Cedar HIll, five miles to the south, will only make things worse. 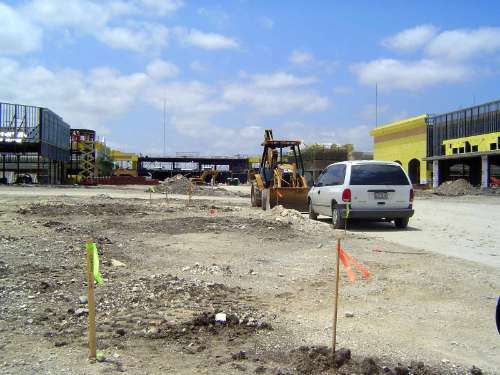 Busy, busy: Cedar Hills takes shape in 2007. You know what to expect, and that's the problem. You're bored, and it hasn't even opened. One way to keep your attention is with good design. 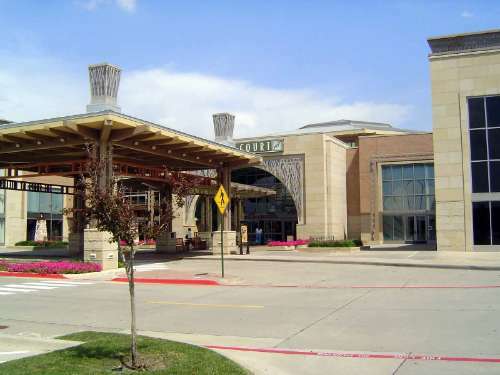 Here's the newly remodelled and very, very successful NorthPark, which opened in 1965 at a great location, measured both by highway access and the wealth of nearby residents. 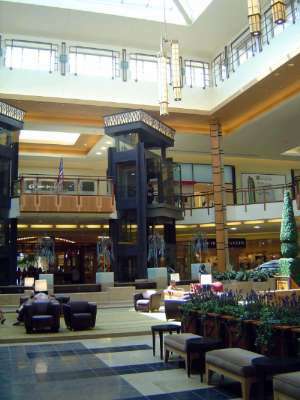 Here's another successful mall, the Galleria, which opened in 1982 and has recently been remodeled. 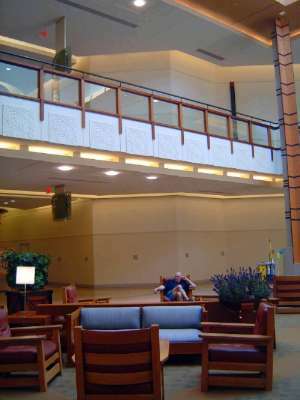 Here's Frisco's Stonebriar, which opened in 2000 and has been successful in part by targeting families with children. 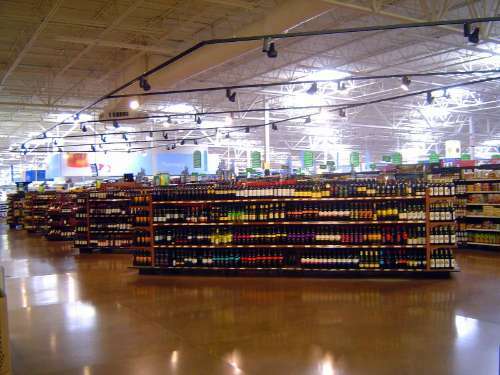 Problem child: this is Willow Bend, only a few miles from Stonebriar and targeting the upscale market. The empty space is a Lord & Taylor that called it quits. A busy scene that never was. The restaurants in the food court opened with great expectations but soon failed, leaving behind the same corporate faces you see in every airport. 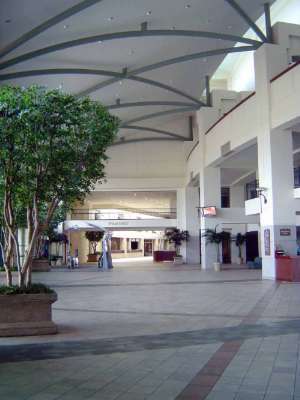 A handsome mall, deathly quiet. The American consumer, especially at the high end, has moved on, wants something different, wants what is called, in developer-speak, "lifestyle centers." Before we look at what lifestyle centers have to offer, maybe we should check the megachurches that flourish near these malls. 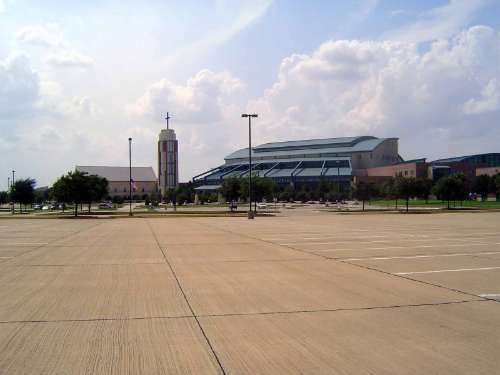 Here's one, mighty Prestonwood Baptist, with a membership of 28,000. A few parking spaces, up close, are reserved for people thinking about joining. 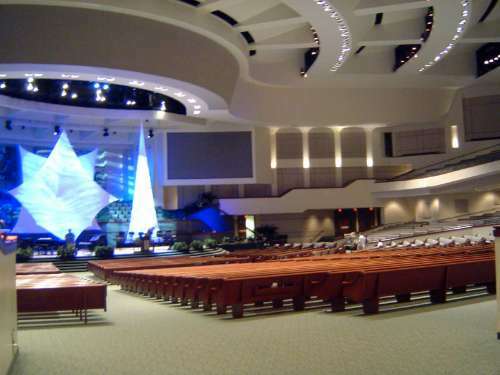 Looks like a mall, but it's the church, accommodating itself to contemporary design. 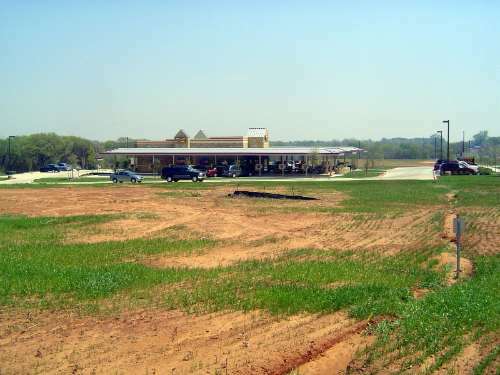 This Sonic Drive-In, on Justin Road west of Flower Mound, sits for the moment, but just for a moment, all by itself.